Genetic means relating to the genes. Genes are responsible for the vast majority of our traits and our unique characteristics. 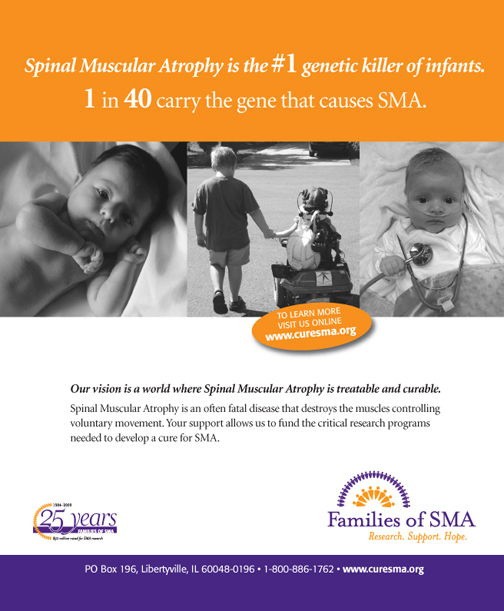 In SMA, there is a mutation in a gene responsible for a protein that supports normal muscle movement and control of the limbs, abdomen, head and neck, chest and breathing muscles. Autosomal recessive refers to how the disease is inherited or passed down from the parents to their child. In SMA, the child who is affected by SMA inherits two copies of a mutated gene, one copy from each parent. While not typically affected by SMA, each parent carries one copy of the mutated SMA gene. Motor-neuron refers to the type of neuron (or nerve) that is affected in SMA. A neuron is a nerve cell that sends and receives messages to and from parts of the body. A motor-neuron is like a wire that sends messages to and from muscles responsible for movement and control in the head, neck, chest, abdomen, legs, and limbs. A neuromuscular disease (NMD) is a disease that affects the peripheral nervous system, which includes the motor-neuron cell body (located within the spinal cord), motor-neuron axons (projections from the cell body to muscles), neuromuscular junctions (the connection between the motor-neuron axons and muscles), or the muscles themselves. The central nervous system includes the brain and the spinal cord. The peripheral nervous system includes everything outside the brain and the spinal cord. The job of the peripheral nervous system is to send information to and from the central nervous system to regulate muscle activity. Next Story → Breast cancer is not just a challenge for those newly diagnosed – it is a challenge for all of us.